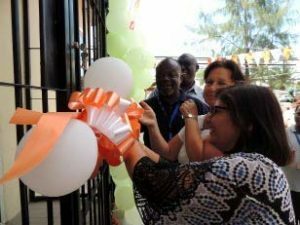 IITA-Tanzania recently inaugurated a new office building for the Facilities Management Services (FMS) and archive for documents at its premises in Dar es Salaam. The event was presided over by the IITA Eastern Africa Hub Director Victor Manyong and the Deputy Director and Country Representative of IITA-Kenya Leena Tripathi. Leena Tripathi cutting the ribbon to officially commission the new FMS building in Dar es Salaam. Manyong said the building will go a long way to decongest the current administration building at the hub. “When we finalized the construction of the science building in 2013, we had plans to add a second building but at the time, we did not have enough resources. I am glad we have managed to save enough to construct this additional office in our premises,” he said. The construction of the FMS building started in January 2018 and was completed in May 2018 at a cost of approximately $35,000. It has two offices, an archive, a store, a workshop, and a kitchen. The project was coordinated and managed by IITA Corporate Services under FMS. The event was attended by IITA staff and partner institutions at the hub—the International Potato Center (CIP), International Rice Research Institute (IRRI), and Alliance for a Green Revolution in Africa (AGRA).